I need to see which cards I have gotten correct and which that I haven't and be able to sort by this. I like the red dot that tells me I have gotten that card wrong. I should be able to see a green dot for those that I have gotten right. Then I should be able to sort to see all the cards in a given stack that don't have any dot because I haven't seen them yet... this way I can focus in on these cards specifically instead of seeing the same cards over and over. The ones you got wrong are the ones we like to emphasize, because they are the ones you need to work on. Putting green dots on everything would look a bit too busy in all likelihood. You can filter the notes to get only the wrong ones. Click the magnifying glass in the filter bar at the top of the notes. It gives you many filter and sort options. (See screenshot). drewmccormack closed this discussion on 13 Dec, 2017 07:44 AM. Thanks for your quick reply. So is there any way to see which cards I have seen/answered vs those I have not yet seen/answered? Not directly. 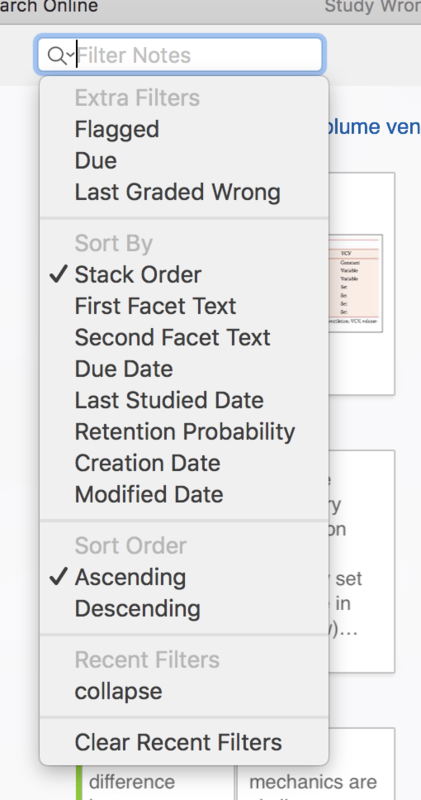 You can sort by Last Studied Date, so the ones you studied most recently appear first. It sounds like you are trying to organize all the study directly yourself. My advice would be to set a study schedule, and let the scheduler handle these details. It is designed for exactly this purpose, and will show you notes you get wrong more frequently. Can you add an option to sort by the conditions you currently provide (as shown in your screenshot above) but without grouping the sorted results in their respective stacks? I'd like to make use of this feature for "all notes", but it still groups them into their stacks, so it provides for very limited usefulness to me. The stacks grouping serves another purpose for me. I don't need the results of my sort grouped into these stacks. Sounds like a useful feature, but also would be a lot of internal changes to do it. Not something I can do immediately. Sorry. I will certainly add it to the to-do list. drewmccormack closed this discussion on 08 Jan, 2018 07:17 AM.